It's not always a good idea to farm the best leathers available. Often you can make as much, if not more gold from older leathers than what you can make from Savage Leather sales for example. To make the most gold, always keep a few small stacks of every leather in the auction house, and put a heavy buyout price on them. Undercutting? What's that? When choosing what leathers to farm, you should check the recent auction prices of all leathers before deciding. 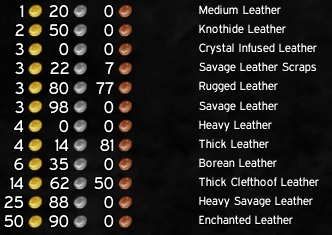 Thick Leather is usually not the most expensive, but there's often a lack of it in the auction house and people leveling leatherworking are ready to pay heavy sums to progress. This includes me! It's wise to throw a few 150g stacks into the auction house and let them rot there, even if there's other sellers. The fees are not high and people will buy your stacks when there aren't cheaper stacks available. There is no point undercutting when selling "uncommon" classic leather. They will sell, if you have patience. Thick Leather is skinned from level 30+ monsters and there is nothing special about it, so this post will be short. It's just an another item to be sold in the auction house - preferably when no one else is selling! To see where a monster is located and other info, click on it's name and see the maps. before deciding what to farm.